The Duterte Die Hard supporters (DDS) started their mission to conquer not only the social media giant Facebook but also twitter which known as the social media base of the opposition. Last week, MTRB board member and artist Mocha Uson started her social media crusade on twitter and many of its user like the former artist Giselle Töngi also known as “G-Tongi” tried to block her mission. G-Tongi responded on the tweet of Mocha Uson about the alleged internet trolls of Vice President Leni Robredo on twitter. She asked Mocha to stop bullying the second most powerful politician in the Philippines by trying to put the power of the opposition on Twitter. Mocha didn’t responded on the tweet of Töngi, but one of pro-duterte blogger Maharlika tried to defend the MTRCB board member. 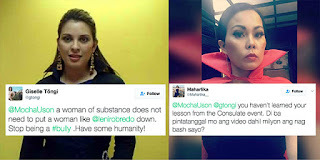 Maharlika tweet that Töngi is the real bully and full of insecurities to Mocha Uson. She revealed that G-Töngi asked to remove the video taken at the consulate event where she questioned the qualification of Mocha Uson as MTRCB board member. @MochaUson @gtongi you haven't learned your lesson from the Consulate event. Di ba pintatanggal mo ang video dahil milyon ang nag bash sayo? Maharlika also claimed that Töngi really wanted to have a one on one interview with communications secretary Martin Andanar, but got rejected. After several tweets, Töngi finally blocked Maharlika on Twitter. Some of the supporters of President Duterte who also gathered on twitter responded on Töngi’s tweet. The supporters of Töngi defended their idol from the swarm of criticisms that she received. @KojishunMercy @gtongi @MochaUson @lenirobredo Te, @bongbongmarcos po yung desperado. Nasa pwesto si Leni di ba? @Chemberluf @gtongi pano naging bully? @tabsuki @Chemberluf @gtongi have you seen the video when she said mocha doesn't fit sa mtrcb dahil about medicine ang background niya?